This GPU upgrade won't break the bank. 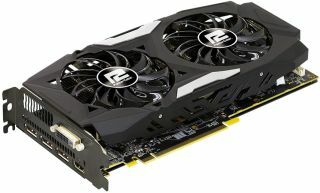 Last week we gave you a heads up about an MSI Radeon RX 480 graphics card that was on sale for $160, one of the lowest prices we've seen for an RX 480 since the Black Friday and Cyber Monday deals. If you missed out, don't sweat it—Powercolor's Red Dragon Radeon RX 480 is currently marked down to the same price. The $160 price tag factors in a $20 mail-in-rebate, so there is a hoop to jump through. Otherwise it's another low price for what is still a very capable graphics card. As you might have guessed by the price, this is the 4GB model, not the 8GB variant. It also features a custom cooler with dual fans that Powercolor claims increases airflow by up to 20 percent compared to stock cooling solutions. You can go here to take advantage of the deal. As for the MSI card, it's still on sale, though it now costs $170 after rebate instead of $160.